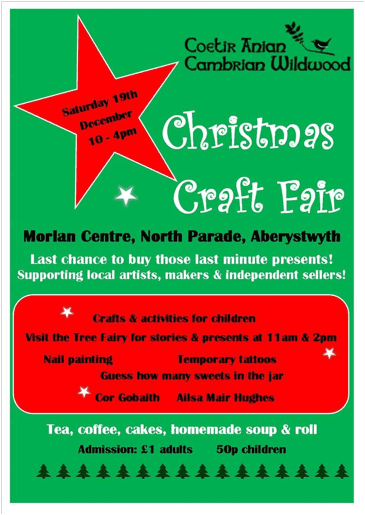 Cambrian Wildwood presents a Christmas Craft Fair on Saturday 19 December from 10am to 4pm at the Morlan Centre in Aberystwyth. There will be craftspeople with stalls selling craft items, activities for kids, a Tree Fairy with stories and presents, music from Cor Gobaith and Ailsa Mair Hughes, and much more. Do your Christmas shopping and have fun all at the same time! At the Craft Fair we hope to raise money and awareness of our project, and have fun in the process. We’re looking for volunteers to help out on the day. Any amount of time you can spend will be gratefully appreciated. We have the room booked from 9am to 5pm, and the event is open to the public from 10am to 4pm. We need volunteers to help set up and clear away, to help out on our stalls – selling tea, coffee, cakes, home produce and soup at lunchtime – and to help out with childrens craft activities. If you’re not able to stay long then maybe you could bake a cake or biscuits or any other delectable item, and bring along for us to sell on our stall. If you can help out on the day then please get in touch with Nicola Charlesworth on 07891 908411.